Congrats! It’s Bladder Health Month and you are now in the DFree club. Now that you have your personal toilet time predicting device. Here are some insider tips from the team, that can help you get the most out of your DFree. 1. Make sure to keep your device and its components dry at all times. Keep it away from liquids or beverages that could enter in through the charging port. 2. Clip the DFree transmitter to the left side of your trousers or belt. I liked to keep mind exposed, so I could be mindful of hitting it against surfaces or walking into doors! 4. When you go to the bathroom, it’s natural to use both hands to pull down your pants. I prefer pulling down the trousers after I have unclipped the DFree, so that it hangs free without any tugs or pulls. Furthermore, it’s easier to sit it on the top of the thigh area till you are done. 4. Notifications. No matter what mobile device you use - iPhone or Android, a lot of us have notifications switched off for most mobile applications. The best way to get the most out of your DFree is to have your mobile do your work for you! Ensure you have your DFree app notifications pop up on the screen (check for persistent banner placement or non-persistent). 5. Keep the sensor clean. This is the part of the DFree that is in contact with your skin and is also secured with the micropore tape. Make sure, you use simple wipe to take off any glue or gel residue between use. 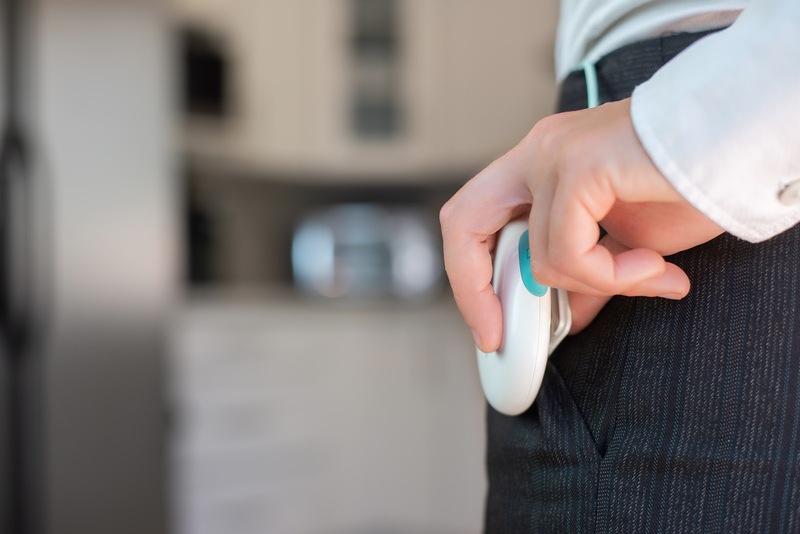 This ensures bladder monitoring without interruptions or eliminates difficulties with the ‘spot check’ tool. 6. Enjoy and relax with the DFree. The first few hours or days when you start using the DFree can make you a bit too aware that you have the DFree on. After that, I almost never forget to charge the device at bed time or leave the house without it. Here are some good habits that come using the DFree! I make a conscious effort to drink a lot of water and have reduced my coffee and alcohol intake. I plan my trips or drives around clean public restrooms and/or ask my friends to meet me at a coffee shop or a restaurant that has a clean restroom. I no longer wait before it’s too long to go to the bathroom. I have a new and improved appreciation for my bladder and I never intentionally stress it out because I can. Because of the ‘spot-check’ feature on my DFree app, I allow myself to take a bio-break in advance, even if I don’t feel like going to the bathroom right away. I am aware of my personal hygiene and have done a great job of keeping dry, clean and comfortable. I sleep better and I have my days planned around more activity and hydration. Overall, DFree has proven to be great personal assistant that keeps me and my bladder in check. Have a question for us? We’d love to hear from you. Get in touch with us at sp-us@www-biz.co or tweet us at @DFreeUS.